Road to Polish Con - Week 11 (Contrary Polish, Noodle Nail Polish) - Polish Etc. For Week 11, we have two exclusive shades from Contrary Polish and Noodles Nail Polish. both of these polishes are beautiful and a must have. They will be available next week from the Polish Con store only. Be sure to pick up your faves! We Sleep, We Dream by Contrary Polish - A deep navy blue with shifty multichrome shimmer and tiny holographic flecks. The shimmer is subtle but shifts softy from green to gold to copper to red. It compliments the dark base very nicely. I was loving it with a dark navy blue shirt I was wearing the other day. This will be a great fall/winter shade! I am showing you two coats with glossy top coat here. Enchanted Love by Noodles Nail Polish - A deep raspberry pink that is packed to the brim with silver holographic microflakies and subtle golden shimmer. A gorgeous shade with a super opaque formula. You can get this opaque with just one coat! I am using two coats with top coat here but I was fine with just one. The sparkle is great here and the base color is great for summer and fall. 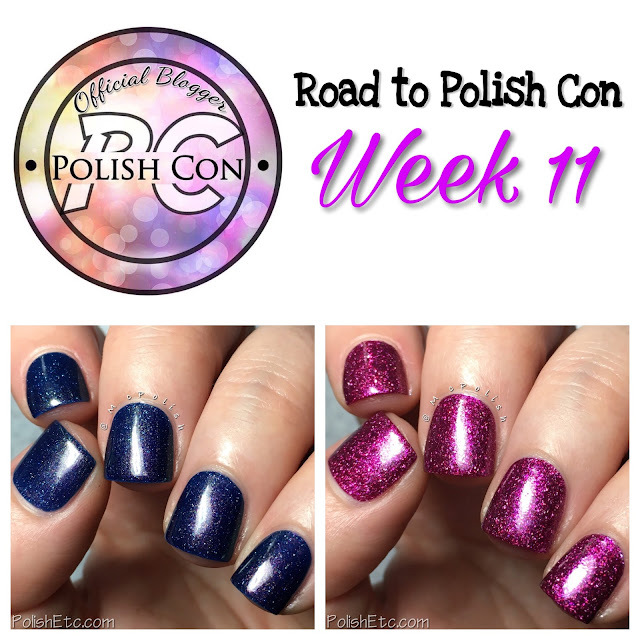 The Week 11 polishes are available for purchase from The Polish Convention store from May 27th though June 2nd. Polishes are $11 each and there are two options from shipping. You can have your purchase shipped now or you can hold all of your polishes from each week to be shipped at a later date. Be sure to check out the latter option on the site because I know you are going to want more shades from this series in the upcoming weeks. Also...they ship internationally!! I have two special codes for you to use during check out. By using my code, you will get extra special goodies in your package for each week that you use it. If you want to get your package shipped now, use the code MCPOLISH. If you are going to be using the hold shipping option, use the code MCPOLISHHOLD and the you will get the hold shipping plus the extra goodies for each week all in the end. The extra bits are different each week! Oh man that Contrary Polish is gorgeous!! !